Looking for a special cat gift? A cat drawing might be the perfect choice. Whether you buy it or make it yourself, a feline-inspired drawing will certainly delight your cat loving friends. Below you will find several tips and ideas that will help you find unique cat drawings. Cats have been a favorite source of inspiration for many an artist, including Leonardo Da Vinci, Rembrandt, and Picasso – among many others. Their drawings of cats are a testament to this fact. Picasso’s The Cat, is a beautiful, deceivingly simple drawing of a cat’s profile. You can find art prints of this gorgeous black and white drawing at several online art stores. It makes a great gift for cat lovers who also love art. These studies showcase cats in different stages of movement, and clearly reveal Leonardo’s mastery of this medium. Curiously, Rembrandt also did an etching titled Virgin and Cat with a Child (also known as The Holy Family with a Cat), which depicts a tender scene with Mary lovingly holding Baby Jesus while Joseph looks on from the window. You can also see clearly a cat lying next to Mary and Baby Jesus. Drew Strouble, of catmandrew.com, is an amazing artist who specializes in cats. Mr. Strouble's drawings of cats are among my favorites. His drawings go from the traditional to the funky, and from the delicate to the humorous. An art print featuring any of this artist's drawings makes a wonderful cat lover gift. This English artist (1860-1939) drew wonderful anthropomorphic cats. He invented a style all his own. Wain's drawings of cats are among my very favorite. Prints of his drawings can be easily found online. And needless to say, these make great gifts for cat lovers. Cat lovers love pictures of cats. They also love cat calendars. So a calendar featuring felines makes a good choice. But don’t just give any calendar. Give one that is fun and out of the ordinary. For instance, calendars featuring acclaimed cartoonist B. Kliban’s drawing of cats make wonderful and affordable gifts. Indeed, Kliban’s cats are outrageous fun. In addition to calendars, Kliban’s cats also grace stationary and magnets. These items make practical and inexpensive gifts. You can also find holiday cards and postcards featuring Kliban’s cats. And of course, you can also give the seminal Cat: Seventeenth Anniversary Edition, a collection of B. Kliban's cats. You can find posters and art prints of cat drawings, including the drawings of Leonardo Da Vinci and Picasso I mentioned before. And of course, you can find drawings of other fine artists. Joshua Hullender is one of my favorites. His drawings of cats are truly exquisite. Many online artists now specialize in pet portraits. So if you want to give a unique present, why not give a portrait of your friend’s beloved cat? This is a perfect gift for you as well. You can commission an oil or pastel portrait, or you can have a cat drawing in pencil instead. I find pencil drawings to be particularly evocative and intriguing. Go to our page about pet portraits for additional information. -- When selecting a cat-inspired drawing, think about what you want the cat drawing to depict. 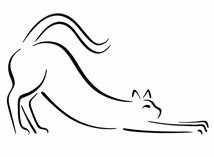 You can find drawings of cats in motion, cats sleeping, cats lying down, and cats playing, for example. -- You can also find drawings portraying faces or full bodies of cats. -- In addition to the traditional black and white drawings, you can find colored pencil drawings as well. -- If you can’t decide which drawing to give, then give a gift certificate. Many online art stores offer this option. If you know how to draw and really want to give a truly original gift, then make it yourself! If you don’t know how to draw but would like to learn how, you may take a class or two. Many schools and colleges offer art classes, from beginning to advanced levels. There are also many good books that show you how to do simple drawings. See below for more information on this topic. If you make your own cat drawings, you can also turn them into unique gifts. For example, you can make calendars or personalize clothing items using your creations. If you have a computer, you can scan your drawings and save them to your computer. Then you can use these drawings to create personalized gifts, such as calendars, books, and cards. Several online stores allow you to upload your own photos and images and create your very own products.